I think I’ve had a million samples of Madara Moonflower Rose Beige Tinting Fluid over the years. I always seem to get them with online orders. Originally I was not a fan, mainly because I found the scent overwhelming but I suspect things have changed over time. Whilst I am still not keen on the fragrance, I feel it may have been reformulated at some point. It's still the same scent but doesn't seem as strong or linger for as long. 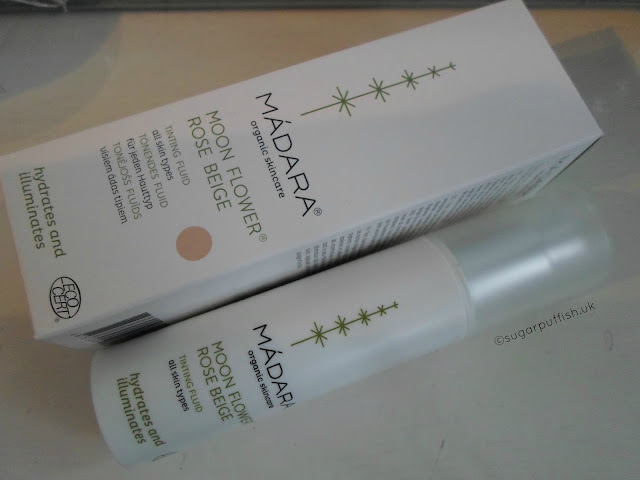 I decided to buy a full sized 50ml bottle of Madara Moonflower because I was looking for bridal makeup. I wanted to avoid the costly outlay of finding a perfect natural liquid foundation. I realised that whilst this tinted moisturiser is great during the summer months it actually can be handy for winter under my mineral powder foundation. I love my Everyday Minerals foundation and I use it daily. The only teeny tiny issue I have with it is by the end of the working day depending on how my skin is behaving it may not always look its best. Now usually that is not a big deal for me, I’m happy to touch up if I go out in the evening but for my wedding day I would rather not have any worries about how I am looking. The Madara tinting fluid provides an extra layer of moisture which helps combat dryness and the added bonus is it evens out my skin tone. With powder applied on top coverage is flawless and the effects last for longer. I also specifically wanted a tinted product without SPF in order to work well for photographs. Madara Moonflower is a little on the pricey side but I picked it up during a promotional offer. There is another colour available called Sunflower Golden Beige which I have tried but it doesn't suit my skin tone as well as Moonflower. Madara is Organic (Ecocert) Vegan, nut free, gluten free and cruelty free. It's available to buy from several websites including *Lucyrose and *Onlynaturals. Have you tried Madara Tinting Fluids? Do you like them? I have tried Lavera before and it just doesn't work for me, you are right about the colour. I've mixed feelings about the GP one but nice to see a new colour because the other was far too dark for me.